Ann Greenwald is a certified movement coach and Neurokinetic Therapy (NKT) practioner. While getting a master’s degree in Biomedical Engineering (specializing in Orthopaedics and Sports Medicine) at the University of Vermont, Ann loved taking aerobics classes at a local Burlington gym to stay in shape and train for triathalons. At the time, she couldn’t afford the gym membership on a grad student stipend, so she got certified to teach group fitness to get a free gym membership! Thirty years filled with continuing education certifications in aqua fitness, indoor cycling, TRX, pilates, and active aging fitness, along with coaching swimming, skiing, soccer, basketball, and baseball (2 active sons, age 21 and 23 years) and a fascination of how the human body moves and functions at all levels has led to the creation of AGIFT Movement Coaching (Ann Greenwald Institute of Fitness Transformation). AGIFT specializes in helping those who struggle with chronic pain, neurological conditions, and balance deficiencies to regain movement freedom and health. AGIFT’s custom designed Better Balance and Movement Freedom Program guides clients toward understanding and embodiment of improved alignment, breathing, and control of movements. Ann believes that true connection and engagement in the process equals fun, health, and happiness for all! Joe Sargent is a certified personal trainer and movement teacher who grew up in Vermont. After studying philosophy at Columbia University, Joe’s interest in the transformation of human experience led him to spend the next 7 years exploring physical and mind-body oriented practices that aim to expand the embodied experience through improved movement, body awareness, and overall health. His methods aim to produce greater strength, flexibility, ease of movement, neuromuscular control, improved athletic performance, and a deeper sense of awareness and connection throughout the body. Some of his influences include gymnastics, circus arts (specializing in hand-balancing), the Ido Portal Method, western somatic practices such as Continuum Movement and the work Moshe Feldenkrais, as well as principles and techniques from martial arts and modern dance. Joe works with his clients to achieve their goals, no matter where they are in their own process of transformation. He believes the most valuable things he has to teach come from his own embodied experience - the skills, physical attributes, and internal qualities of awareness and kinesthetic sensitivity that he has developed over the years. Kevin Comeau provides bodywork and personal training at Open Door. The principles of centering and biomechanical efficiency borrowed from martial arts feature strongly in his approach to exercise. Whether working on flexibility, strength, balance, or agility, participants in Kevin’s classes maintain mindfulness toward using their bodies in an integrated manner. Kevin's aim in training, as with bodywork, is the restoration and maintenance of movement: free, full, and painless. The particulars of fitness- functional strength, suppleness, higher capacities- are built upon this foundation. Kevin is a certified personal trainer and has practiced and taught traditional Japanese martial arts for thirty-five years. 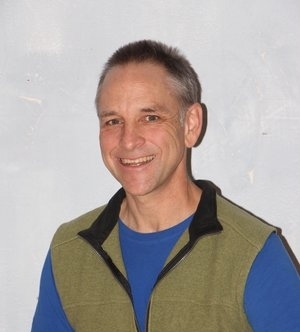 He has been a deep tissue massage and myofascial release therapist for 25 years; for the past 21 years he has taught advanced massage classes at the River Valley Community College and body awareness at the Community College of Vermont.